BJE March of the Living is a two week experience during which teens from all over the world travel together to Poland and to Israel to learn about the Jewish people’s past, present and future. A 3-part orientation, the Farber Workshop Series, prepares participants for the experience. The program in Poland focuses on pre-World War II Jewry and the Holocaust. The Los Angeles delegation is honored to be accompanied by Holocaust survivors who become guides, story-tellers and surrogate grandparents to the group. The fee for this unique program, including round-trip travel from Los Angeles, room and board, tuition and varied social and cultural programs, is $6,595*. Please note that financial assistance is available from various sources. The BJE March of the Living experience is available to all Jewish teens, regardless of their family’s financial status. There are individual subsidies and grants, as well as need-based assistance available. Please check the box indicated in the on-line application if you would like to receive more information. *This rate is generously subsidized by BJE, the Jewish Federation and International March of the Living. The BJE March of the Living experience teaches a profound lesson in Jewish history, personal Jewish identity and has a powerful life-changing impact on its participants. 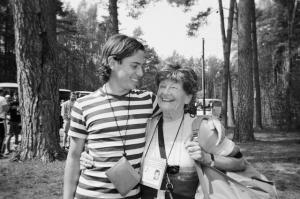 The program uniquely helps teens to face the most significant events in the modern history of the Jewish people as they weave them into their own personal connection to the Jewish people. On Holocaust Remembrance Day the Los Angeles delegation, along with thousands of people from all over the world march in solidarity from Auschwitz to Birkenau to remember the lives lost during the Holocaust. In Israel, programming gives participants the opportunity to reflect on the hardships they saw during the past week, but also to look forward and see all of the incredible accomplishments and advancements the Jewish state has made since its establishment. The core programming of the week in Israel is centered around two days: Israel’s Memorial Day and Israel’s Independence Day reinforcing the fact that Am Yisrael Chai – the Jewish people and the Jewish homeland live! Under the leadership of Maya Aharon and Liat Vorobiev, the 2019 Los Angeles Delegation will consist of 6 remarkable Holocaust survivors, 26 staff and 218 extraordinary teenagers who will join 15,000 Jewish teens from over 60 countries around the globe in remembering our past, living the present and marching into the future. *Subject to change if flights are rescheduled. For more information Candace Brand (Program Assistant) at (323) 761-8609. Follow Us on the Blog! !